An FBI agent tracks down and catches a young con artist who successfully impersonated an airline pilot, doctor, assistant attorney general and history professor, cashing more than $2.5 million in fraudulent checks in 26 countries. Writers: Jeff Nathanson, Frank Abagnale Jr.
Taglines: The true story of a real fake. 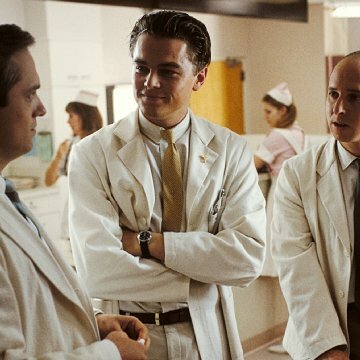 Cameo: [Frank Abagnale Jr.] The real Frank W. Abagnale Jr arrests Leonardo DiCaprio in France, he is the man in the coat and hat who pins Leonardo against the police car. Anachronisms: When Frank Abagnale Jr. first walks into the classroom where he impersonates the substitute teacher, one of the students is heard to use the word "frickin'", a word not coined yet in the 1960s. Principal Evans: Mr. and Mrs. Abagnale, this is not a question of your son's attendance. I regret to inform you that, for the past week, Frank has been teaching Mrs. Glasser's French class. Principal Evans: Your son has been pretending to be a substitute teacher, lecturing the students, uh, giving out homework, uh. Mrs. Glasser has been ill, there was some confusion with the real sub. Your son held a teacher-parent conference yesterday and was planning a class field trip to a French bread factory in Trenton.